Ferndale Striped Trousers: Worth Every Penny! Wow! These are great! Wore them w/ my Vigilante coat to Church & received lots of compliments. I’m one of those jack of all trades kinda guys. I can weld as well as stitch a seam so I hemmed them with a 1″ rolled up cuff for snazzy-ness sakes. Also, ordered a size up like they said to do & what a perfect fit! 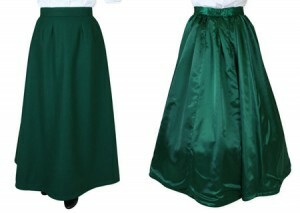 Constance Reversible Wool Skirt – Dark Green: Gorgeous! This skirt is absolutely gorgeous. 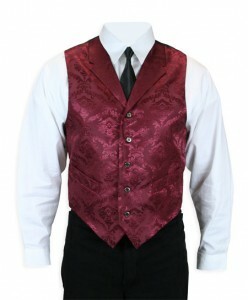 It is made in a way one never, ever sees these days with fine fabric, attention to detail, and excellent workmanship. I love it! I am 5 feet tall and 110 pounds, and had to have it shortened, but I chose a fine seamstress because I wanted it to be done professionally. I feel like a million dollars wearing it! 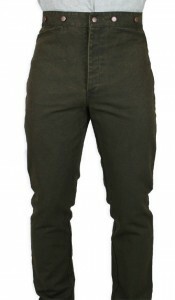 Classic Canvas Trousers – Walnut: Great Trousers! My order arrived earlier than expected. Opened the package and found my trousers looked better and fit better than I hoped for. Stout pants that will soon be my favorites. I will be ordering another pair, maybe in black, very soon. Those folks have good products and are the nicest people to do business with. This skirt (And company) is AMAZING… I ordered it for NYE to go with a stunning corset I had just won in a contest, & the shipping was SO FAST that I got it in PLENTY of time. Aces. Just Aces. As all of the merchandise from GE. Hard to find 100% period correct wool pants. In just the Color I wanted.